It's bitter cold outside, but inside the fire is cozy warm. The Christmas tree lights are on and here and there around the house candle light flickers. Christmas music is playing in the background. The hubs is sitting here reading, while I type away. but there have been other Christmases when it hasn't been so easy. If you feel comfortable to do so, leave a comment if this is a hard season for you. I'd like to pray for you. I've been there, and I know that just knowing someone else is praying is a comfort. Know that you will walk right on out of this valley one day. This season of the hard eucharisteo* won't last forever. no reoccurrence and no new problems! -very upsetting news for a family in the church that ended up to not be true! 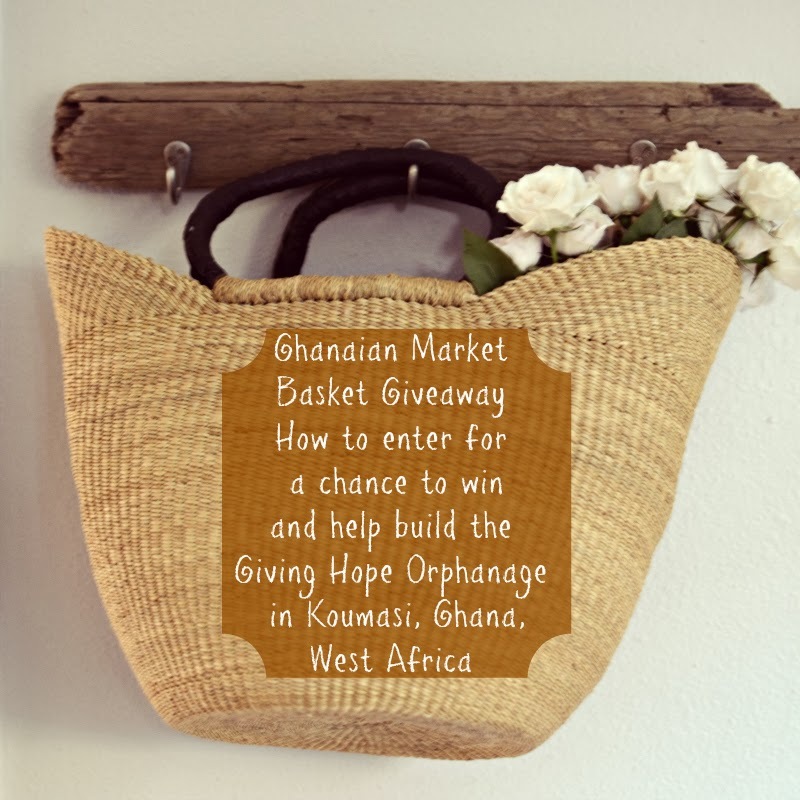 See how to enter my giveaway for this beautiful Ghanaian Market Basket by clicking on the photo. So glad for your good news and that of your brother-in-law - looks like lovely, cozy Christmas at your home. No snow here - but waiting with hope. This is a tough season for my husband's family, with the loss of a sister in Oct and my MIL almost dying a few weeks ago with a ruptured esophagus. She can't drive yet - and that bothers her. MY SIL left behind 3 sons - the youngest 13. Praying that things of God comfort them all in this season. Thank you, Elizabeth for this post! Praying for your family. Praying for the very evident presence of God to comfort you all during this season of loss...especially those who just lost their mother. It seems as if I always have the same prayer, that of God's financial provision over my family, especially in this season. I am so thankful to hear the good news about your brother-in-law. God is good! Praying that this season of financial strain will come to a close, that God will open doors of plentiful provision for you. Also asking Him to strengthen you and encourage you. Love to you, friend. A wonderful and encouraging post, Elizabeth. Have a blessed week. Thank you, Dayle. You have a blessed week as well. Devotions by the fire sounds heavenly to me. I love coming here for these posts, Elizabeth. Thank you. Thank you, friend. You are a blessing to me! Just left a highly stressful job that was tearing me up inside, and asking for prayers that a new position opens up soon. I know the Lord is leading me... just need the patience to wait it out while dealing with my husband's negativity. Your blog is a blessing-- thank you. Karen, I pray for God to open the doors to just the right place for you! I am also very blessed, especially in trusting that God will meet my needs. What a wonderful God we have that we can leave our fears and worries with him and trust him to take care of our days. Love your journaling of gratitudes. There are so many of them in our lives. God bless you Jeanne! Thank you so much for stopping by and taking the time to comment. No matter what worries seem to take us over at times, we can always find those little (or big) things to be thankful for, if we only make a point to remember and dwell on them. Thank you for this inspiring post. Thank you for your encouragement to me, Debby! Elizabeth. Thank you for your beautiful pictures & encouraging words! God is good. God continually bless you & your family. God bless you and yours, Carol! Somehow I missed this post until today. I needed your words this morning as I woke to another day of unplanned activities this Christmas season. I know you are already praying - and I have many days of just putting one foot in front of the other. God is good - and He is close in my dear, little mother's situation and all the decisions that have to be made soon.